Mexican star lamps were designed for outdoor patios, yards and gardens. 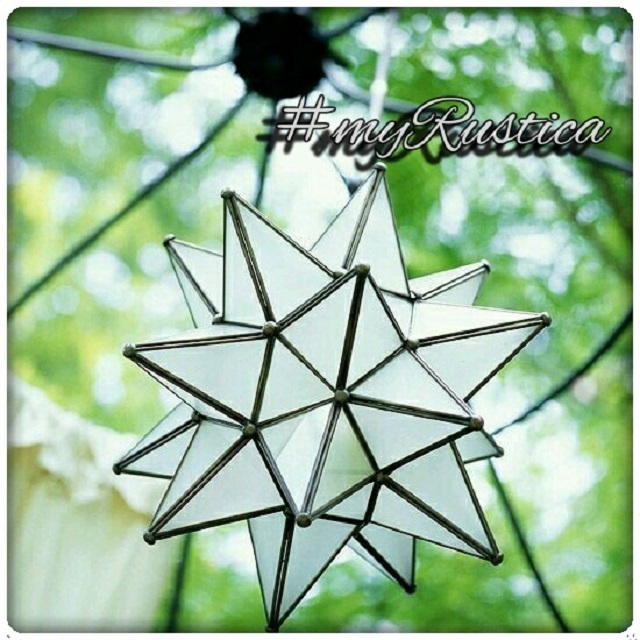 A handmade of punched tin and colorful glass star can be also used for decorating indoor rooms and verandas. Lamps handcrafted from pierced metal illuminate wonderful light. Some of them are decorated with color crystals only adding to their beauty underlining Mexican character. Apart of metal lightbulp covers, Rustica House produces in San Miguel de Allende decorative lamps created entirely from blown glass. It can be clear or semitransparent white, blue, red, yellow and green. Our Mexican star lighting fixtures are fabricated in three basic sizes or as custom made. Stars are a great idea for designing rustic residential spaces as well as illuminating restaurants and bars.